Yes, these are fully recyclable. For an economical choice in your workplace store cupboard, our C Fold Paper Hand Towels in Green have been formulated using recycled paper. Delivered in a 1-ply weight, each sheet offers highly absorbent properties and is a hygienic solution to drying hands and spills quickly without the availability of a hand dryer. 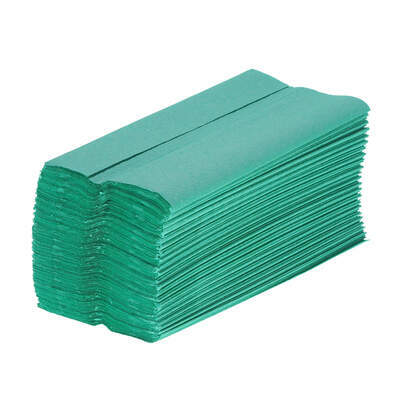 Our c-fold paper towels are also recommended when user-patient contact is frequent in a business with the friction of the paper working to easily remove bacteria and pathogens from the body. An ideal accompaniment to your existing contamination control and infection prevention schemes, these towels have also been Ecolabel certified and pack efficiently into our Paper Towel Dispenser while releasing a single towel at every use. Dimensions: Folded - 227 x 92mm? Standing up against competing brands, these hand towels come from our own Proform range and offer an economic option for businesses seeking good quality with wholesale prices. They also fit perfectly into our Paper Towel Dispenser C V Fold Bright White and loaded into any toilet or washing facility for instant use.